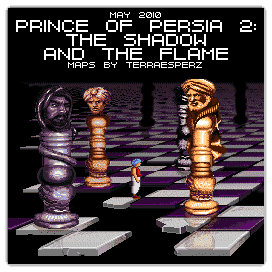 For this month's "Maps Of The Month" featurette, I wish to draw your attention to TerraEsperZ's Prince Of Persia 2: The Shadow And The Flame (PC) maps. At the end of the first game, the hero becomes the titular Prince Of Persia by marrying the princess. But now, mere days later, he is magically rendered unrecognizable as he enters the royal courts. Now appearing as a beggar, the hero's presence is unwelcome. The villain Jaffar, disguised as the prince, has the hero thrown out. Escaping the guards, the hero leaves the city by jumping to a merchant ship, which is then struck by lightning by Jaffar. Our hero wakes up on the shore of a foreign island, and now must return to Persia to defeat Jaffar. And to save the princess, of course. Running, jumping, climbing, and sword fighting ensue. This game has not been ported over onto many platforms as much as the original and iconic Prince Of Persia game. But it has some ports. Among them are an "incomplete" Super NES version which is missing the last area, and an unreleased Sega Genesis version. For that matter I believe the PC versions of the first two games should be considered the definitive ones. So to recognize the effort put into making these timely maps, TerraEsperZ's Prince Of Persia 2: The Shadow And The Flame maps will be known as VGMaps.com's Maps Of The Month for May 2010. Congrats on getting the second Prince of Persia MotM award Terra. The POP2 perfection would be at its peak if the fifth level were complete. To the left of the starting room, is a room containing a life enchancement potion. On the other hand getting there is tricky and you won't to place that room if its not important or part of escaping from the caves. I've like Prince of Persia 2 for its different locations and level types. My favourite levels are of the red temple of the Eagle Men. The most unusual encounter to me was the flaming sword that fights by itself. Anybody could have mistaken it for a powerful scimitar of some sort at first sight. What disappoints me about the game are that the 75 minutes given are not accurate to the actual timeline the prince takes to get to the palace which is approximately two days and two nights. Also the wall spikes pose little threat compared to the floor spikes from the prequel, but the blade trap is a tricky hazard compared to the jaws. It puzzles me why the prince in the gameplay is wearing a blue turban when his actual turban is white. Various versions of the game had unique glitches in them. In one, you have the prince touching the right wall, put his back to it, then draw your sword immediately sheathing it and the prince goes through the wall. Another glitch is in the eighth level, where you have the prince touching the closed gate from the right side of it then drawing your weapon and walking left, passing it perfectly. Yet another glitch is pressing up when in front of a door then pressing 'Esc' key a second after the prince disappears up the door then pressing one the direction keys to make the prince do a hovering walk. Several times you do this makes the prince really hover high. Indeed the other ports of POP2 are terrible in quality as the maps I have done show. Its strange that the Sega Genesis and SNES versions of the first game are very good quality yet the sequels are completely the opposite. The Apple Macintosh version however has excellent detail making it exceptional from the other ports. Dang, I always meant to go back to correct that, as it was pointed out to me a few times in emails, but I just never took the time to fire up DOSBox again to do it. I'll try and do that by the end of next week, if only to save my honour as a mapper! I'm currently working on it, so I should be able to send it tonight. An annoying thing when correcting an old map is that there are things I'd like to do different in the presentation, but it would require modifying all the other maps for consistency, which I'm not willing to do. I think I understand now why some creators alter things when revisiting old works of theirs, even if it also annoys me from an historical point of view.